I spent the first weeks of January carefully reviewing fashion magazines, following the pret-á-porter collections of my favorite designers. I’ve concluded that some of this year’s most influential trends will divide the passionate fashion women into two camps. These trends will either be loved or hated. Below I’ve listed the most important and versatile ten trends that I think you will enjoy wearing (or not) in 2018. 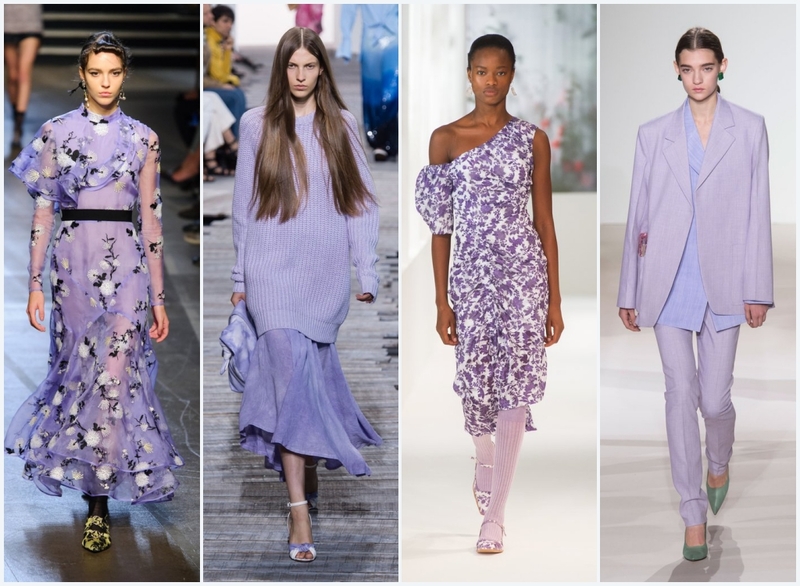 The 2018 spring season starts well with UltraViolet as the color of the year. You can opt for darker shades. But, in my opinion, the lighter ones are much more feminine and easier to wear, regardless of the tone of the skin. You can choose a lilac pantsuit and pumps in a contrasting color. Or you can go for a basic white shirt, a purple pleated skirt and a pair of flats. I would add to the outfit a leather jacket in a warm, light shade and some accessories. Just like with the violet, plaids are quite challenging to wear from head to toe. That’s why the safer choice is to wear simple tops with skirts / plaid pants. It’s a perfect fit for the reversed triangle figure or the apple silhouette. If you want to accentuate the top of your outfit, you could go for a monochrome one (trousers and blouse) with a plaid jacket for that pop of color. In the spring of 2018, you’ll see trench jackets everywhere. As usual, I would say. But this year’s trench is a bit different, with a lot of asymmetric plays in textures and fabrics, to emphasize the top of it. If you know you have a big bust, broad shoulders stay away from this cut. Wearing this type of trench will only accentuate the upper body. 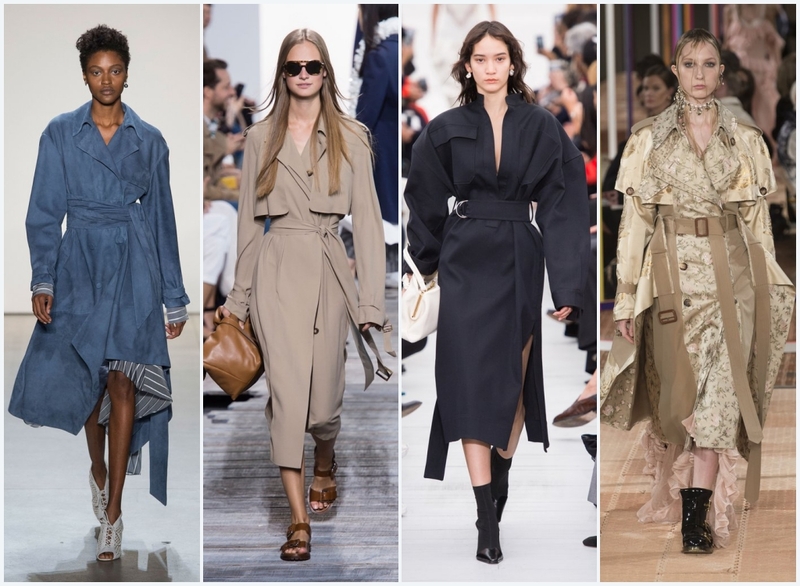 It’s better to choose a classic trench, an A cut, with a belt just to accentuate your waist and give you the desirable hourglass silhouette. I was reading an online article at one point, and a phrase hit home base with me: “You have to wear trends, not let them wear you.” The point is that you have to choose the trends that suit you, as far as they fit with your body type and personality. Trends have to emphasize your beauty, not to hide it. This concept also applies to fringes. It’s known to be a tricky trend to wear. But with the right style and proportions sense, you can put on a WOW outfit with fringes. Romanticism reaches alarmingly high levels in 2018 with floral prints inspired by the ’60s fashion. So keep an eye on the collections in stores to start the spring with a floral piece. I’ve already spotted the trend in Zara and Mango stores: floral print dresses and blouses with frills, ruffles and all that was the fashion of the ’60s. Do you remember the fanny pack of the ’80s – ’90s? There wasn’t a kid in the neighborhood who would not wear one on his belt. I have to admit; it was efficient. I’ve been in mountain and sea camps with a fanny pack at my waist, like most of my generation. But from an aesthetic point of view, I find it hideous. I won’t be a grinch about it. And just to compromise on the matter, in 2018 I would opt for a belt bag. It looks good with monochrome outfits; it can be the color of the look. And it draws attention to the thinnest part of the silhouette, the waist, always a plus for a woman. Head to toes denim – YES! Dark denim jeans and top, dark denim overalls, a well-structured jacket are on the list of must-haves for 2018. Add a pair of sensational high heel shoes, and you got a trendy outfit which combines clothing pieces that I’m sure you will love to wear for a long time. At the opposite side of the dark denim trend you will find the bold combos of prints: plaids and flowers, contrasting colors overlapping, all in the same outfit. It’s not for the tender-hearted. And it does not fit well on everyone. You have to have a confident attitude to be able to wear it with style. Even the shoes, the accessories and the hairstyle must be on the same bold note. Overalls are trending in 2018. Everyone loves them. Until you have to go to the lube, right 😉 ? You can wear the overalls with the chicest of pumps, with sneakers and even with flip-flops. I have only one tip for wearing overalls. You can embellish the boyish cut of the overalls by wearing them with a nice belt, that will accentuate your waist or choose a unique pattern, a pastel color that screams spring. Necklaces, earrings, rings, whatever you want, it needs to be in the oversized version. In 2018, we will see the return of these statement pieces of massive jewelry. The good part of oversized jewels is that they are the accent points of the outfit. They help you draw attention to the areas you want to highlight. If you want to look taller, for example, you can wear a monochrome outfit with a long, long necklace. Or you can wear a very deep neckline and “cover” it with a large piece of jewelry. The attention will remain on the top of the body. The trend of oversized accessories does not apply to the sunglasses department. 2018 is the year of small, very tight glasses. I’m going to say it; they’re cute if you want to take a photo session for your blog. But in extreme sun conditions, you will want your aviators by your side. In this case on your nose 🙂 . Those were my thoughts and recommendations of the day on the 2018 fashion trends you’ll love to wear. Keep it classy and don’t forget to subscribe to our free newsletter for more online deals and fashion trends. Happy shopping!